Received: July 23, 2018; Revised: July 31, 2018; Accepted: August 8, 2018; Published online: September 20, 2018. Transglutaminase 2 (TGase 2) plays a key role in p53 regulation, depleting p53 tumor suppressor through autophagy in renal cell carcinoma. We found that microtubule-associated protein 1A/1B-light chain 3 (LC3), a hallmark of autophagy, were tightly associated with the level of TGase 2 in cancer cells. TGase 2 overexpression increased LC3 levels, and TGase 2 knockdown decreased LC3 levels in cancer cells. Transcript abundance of LC3 was inversely correlated with level of wild type p53. TGase 2 knockdown using siRNA, or TGase 2 inhibition using GK921 significantly reduced autophagy through reduction of LC3 transcription, which was followed by restoration of p53 levels in cancer cells. TGase 2 overexpression promoted the autophagy process by LC3 induction, which was correlated with p53 depletion in cancer cells. Rapamycin-resistant cancer cells also showed higher expression of LC3 compared to the rapamycin-sensitive cancer cells, which was tightly correlated with TGase 2 levels. TGase 2 knockdown or TGase 2 inhibition sensitized rapamycin-resistant cancer cells to drug treatment. In summary, TGase 2 induces drug resistance by potentiating autophagy through LC3 induction via p53 regulation in cancer. Recently, highly increased expression of transglutami nase 2 (TGase 2; E.C. 2.3.2.13, protein-glutamine γ-glutamyl-transferase) was observed with an increase of autophagy in renal cell carcinoma (Ku et al., 2013; Kang et al., 2016). TGase 2 may induce autophagy by increase of free ammonia with polyamines (Cheong et al., 2012a), because it is known that polyamines are the best substrates of TGase 2 (Folk, 1980). Polyamines, such as monodansylcadaverine, accumulate in the autophagosome, and are used as a detection marker for autophagosomes (Munafo and Colombo, 2001). Therefore, understanding the role of TGase 2 in autophagy may reveal a critical role of polyamines in autophagy. TGase 2 belongs to a family of Ca2+-dependent enzymes that catalyze Nε-(γ-L-glutamyl)-L-lysine isopeptide bond formation between peptide-bound lysine and glutamine residues (Folk, 1980). In cancer, TGase 2 promotes survival signaling such as NF-κB (Lee et al., 2004; Cao et al., 2008; Kim, 2011), HIF-1α (Kim et al., 2011), and Akt (Kang et al., 2004; Verma et al., 2008), which induces cell growth and resistance to cell death. TGase 2 also promotes autophagy for survival under stress condition including starvation (Ku et al., 2013; Kang et al., 2016). It was reported that TGase 2 deletion induces dysfunction of autophagosome maturation in TGase 2 knockout mice, which is led by marked increase of LC3-II and damaged mitochondria under starvation (D’Eletto et al., 2009). Later, TGase 2 knockout mice display impaired autophagy and deposit of ubiquitinated protein aggregates under starvation (D’Eletto et al., 2012). They suggest that TGase 2 binds to ubiquitinated protein aggregates which also binds to p62 via UBA domain interacting with LC3 via LIR domain (Birgisdottir et al., 2013). TGase 2 activity is important during autophagy since inhibition of TGase 2 activity leads to the accumulation of ubiquitinated proteins (D’Eletto et al., 2012). TGase 2 may drive autophagy forward in cancer cells, because we found that TGase 2 expression was correlated with the level of LC3 in various cancer cells. Autophagy is reported to be regulated by p53 expression (Tasdemir et al., 2008b) as well as levels of LC3 mRNA and protein in cancer is tightly suppressed by p53 (Tasdemir et al., 2008a; Scherz-Shouval et al., 2010). In this study, we tested whether TGase 2 expression may potentiate the autophagy process through p53 depletion in cancer cells. The TGase 2 antibody was obtained from Lab Vision (clone CUB 7402; Fremont, CA, USA), the β-actin (sc-47778), p53 (sc-126) and SQSTM1/p62 (sc-25575) antibodies were obtained from Santa Cruz Biotechnology (Santa Cruz, CA, USA), and ATG5 (#12944), ATG12 (#4180), LC3A/B (#12741) and Beclin-1 (#3495) antibodies were obtained from Cell Signaling Technologies (Beverly, MA, USA). TORIN-2 were purchased from Selleckchem (#S2817, TX, USA). CAKI-1, A549, MCF7 and HCT116 cell line was obtained from NCI (NCI; MTA no. 2702-09). Cells were cultured in complete RPMI 1640 containing 10% fetal bovine serum under 5% CO2 and 100% humidity at 37°C. MCF7 rapamycin resistant (MCF7-RR) and HCT116 rapamycin resistant (HCT116-RR) cells were selected from MCF7 and HCT116 cells by gradual increase of rapamycin treatment from 1 to 4 µM in 4 passages under the same culture condition as above. A small interfering RNA (siRNA) duplex targeting human TGase 2 or p53 (Genolution, Seoul, Korea) was introduced into cells using Lipofector-EXT (AptaBio, Yongin, Korea), according to the manufacturer’s instructions. As negative controls, cells were incubated with Lipofector-EXT (AptaBio) and a negative siRNA (Genolution). To induce autophagy, CAKI-1, A549, MCF7 and HCT116 cells were treated with EBSS (E3024, Sigma Aldrich, St. Louis, MO, USA) for 4 hours. For Western blot analysis, cells were lysed using by RIPA buffer and protein assays were carried out to normalize the proteins by using a BCA protein assay kit (Pierce, Rockford, IL, USA). 10 µg of total proteins were loaded SDS-polyacrylamide gel and transferred to PVDF membranes. The membranes were incubated 1 h with 5% BSA in TBS plus 0.1% (v/v) Tween 20 and then incubated with indicated antibodies (1 h 30 min) at room temperature. The primary antibody against TGase 2, p53, ATG5, ATG12, LC3, Beclin-1, p62 and β-actin were used at an optimized dilution ratio of 1:1000. After three washes with TBST, membranes were incubated for 1 h with HRP-conjugated secondary antibody, at room temperature. Membranes were washed five times with TBST, and chemiluminescence detection was performed using westsaveTM (Abfrontier, Seoul, Korea) followed by imaging using FUSION-Solo.4.WL (Vilber Lourmat, Collégien, France). Total RNA was extracted from various cells using TRIzol® Reagent (Life Technologies, Carlsbad, USA) according to the manufacturer’s protocols, and RNA concentrations were measured absorbance at 260 nm using by Thermo Fisher Scientific, Waltham, MA, USA. The cDNA synthesis was conducted using RevertAid First Strand cDNA Synthesis Kit (Thermo Scientific). Real-time PCR was performed using a LightCycler®96 system (Roche, Basel, Switzerland). To determine quantitative sybergreen real-time PCR, amplification was conducted with Accupower® 2x GreenstarTM qPCR-MasterMix (Bioneer, Deajeon, Korea). Primer sequence were as follows: human TGase 2 forward: 5′-AGA ATC CAG AAA TCA AGA TCC GG-3′ and reverse: 5′-CTC CAC AGT GAA GGT GCA G, p53 forward: 5′-CTT TGA GGT GCG TGT TTG TG-3′ and reverse: 5′-CCC TTT CTT GCG GAG ATT CT-3′, LC3 forward: 5′-AGC ACA GCA TGG TGA GTG-3′ and reverse: 5′-GTA GAC CAT ATA GAG GAA GCC G-3′, actin forward: 5′-CAA GCA GGA GTA TGA CGA GTC-3′ and reverse: 5′-TGT CAA GAA AGG GTG TAA CGC-3′. The inhibition of tumor cell growth was analyzed by XTT assay (Cell Proliferation-assay Kit 30-1011K, ATCC, Manassas, VA, USA). Briefly, cells were plated at 2×104 into a 96-well plate and incubated overnight to adhere. Cells were treated with rapamycin or GK921 (0, 250, 500, 1000 nM) as TGase 2 inhibitor for 8 h. The absorbance was measured at a wavelength of 475 nm using a spectro star nano (BMG LABTECH, Ortenberg, Germany). 96-well microplate assay of autophagy using cells was performed according to manufacturer’s protocol (Cyto-ID Autophagy Detection Kit) (Enzo Life Sciences, Farmingdale, United States). Briefly, cells were plated at 5×103 into a 96-well plate and incubated 24 h to attach. Cells were transfected with TGase 2 siRNA or HA-TGase 2 over-expression vectors for 24 h or 48 h, respectively. Transfected cells were stained with CYTO-ID Green detection reagent in EBSS medium for 30 min at 37°C. The absorbance was measured at a wavelength of 488 nm using a spectro star nano (BMG Labtech). Cancer cells were grown on coverslips and transfected with TGase 2 siRNA or HA-TGase 2 plasmids. These cells were fixed in methanol for 30 min at −20°C. Fixed cells were stained with anti-LC3 antibody. Alexa 488 (green) conjugated secondary antibody was used for visualization. DAPI was used to contain the nuclei (blue). Cells incubated with secondary antibody alone was used as control. A confocal scanning analysis of the cells was performed using an Axiovert 200M laser scanning confocal microscope (Carl Zeiss, Oberkochen, Germany). Statistical analysis was performed using the Student’s t test, as appropriate and indicated in the Fig. 1–4. 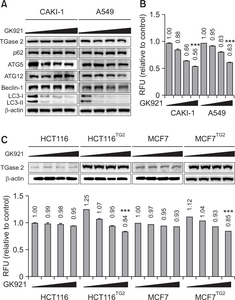 Among cancer cells, CAKI-1 and A549 showed high expression of TGase 2 while HCT116 and MCF7 showed low expression of TGase 2 (Fig. 1A). To test whether expressions of autophagy factors can be regulated by TGase 2, major autophagy factors of p62, ATG5, ATG12, LC3 and beclin-1 were analyzed by immunoblotting after TGase 2 knock down using siRNA in CAKI-1 and A549 cells or TGase 2 transfection using HA-TGase 2 in HCT116 and MCF7 cells for 24 h with treatment of autophagy inhibitor chloroquine under amino acid deprivation (Fig. 1A). Among autophagy factors, LC3 was reduced down to one tenth by siRNA of TGase 2 treatment in A549 cells as well as LC3 was highly induced up to 3 fold by TGase 2 transfection in HCT116 cells compared to the control (Fig. 1A). Autophagy was measured with an autophagy detection kit using CYTO-ID green reagent under the same condition as above (Fig. 1B). By TGase 2 knockdown, autophagy decreased about 21% and 27% in A549 and CAKI-1 respectively, while by TGase 2 transfection autophagy increased about 12% and 25% in MCF7 and HCT116 respectively, compared to the control (Fig. 1B). The regulation of LC3 by TGase 2 was also confirmed by immunocytochemistry analysis of LC3 with DAPI staining in A549 and MCF7 cells under autophagy condition with chloroquine treatment and amino acid deprivation (Fig. 1C). A549 showed high expression of LC3, which was significantly reduced with siRNA of TGase 2 treatment (Fig. 1C). MCF7 showed very low expression of LC3, which was remarkably increased by TGase 2 transfection (Fig. 1C). To determine whether LC3 expression was dependent on TGase 2 expression, LC3 expression was measured using LC3-GFP stably transfected A549 cell line after siRNA of TGase 2 treatment, which resulted in significantly reduction of LC3 positive spots (Fig. 1D). LC3 expression was also measured using LC3-GFP stably transfected A549 cell line after autophagy was induced using TORIN-2, mTOR complex I, II inhibitor, with or without siRNA of TGase 2 treatment under normal culture condition (Fig. 1E). TORIN-2 increased the expression level of GFP-LC3 in the siRNA control while TORIN-2 induced autophagy was almost totally blocked by siRNA treatment of TGase 2 (Fig. 1E). Therefore, TGase 2 expression regulates autophagy promotion in cancer cells. To test whether TGase 2 mediated autophagy induction is also reversed by TGase 2 inhibitor treatment, TGase 2 inhibitor GK921 (Ku et al., 2014) was treated (Fig. 2). To enhance detection of autophagy markers, GK921 treatment was overlapped with treatment of autophagy inhibitor chloroquine under amino acid deprivation (Fig. 2). LC3 was critically reduced by TGase 2 inhibitor GK921 treatment in a dose dependent manner (0, 250, 500, 1000 nM) in CAKI-1 and A549 cells (Fig. 2A). Following to the reduction of LC3, autophagy activity using CYTO-ID green reagent was also reduced up to about 37% and 44% in A549 and CAKI-1 respectively by GK921 treatment in a dose dependent manner (Fig. 2B). In the HCT116 and MCF7 cells transfected with TGase 2 (MCF7TG2 and HCT116TG2), immunoblotting of TGase 2 showed that TGase 2 was significantly induced, which was significantly decreased by GK921 treatment in a dose dependent manner (0, 250, 500, 1000 nM) (Fig. 2C). Autophagy activity using CYTO-ID green reagent showed induction up to about 12% and 25% in MCF7TG2 and HCT116TG2 respectively, compared to the activity of MCF7 and HCT116 (Fig. 2C). The autophagy activity was also reduced up to about 27% and 41% in MCF7TG2 and HCT116TG2 respectively at 1 µM of GK921 (Fig. 2C). To test whether p53 suppresses LC3 transcription in cancer, CAKI-1 and A549 cells were transfected with p53 overexpression vector (0, 1, 2, 4 µg) for 24 h and LC3 expression was measured by qRT-PCR at linear amplifying curve (Fig. 3A). LC3 transcription was reduced by p53 transfection in a dose dependent manner, which showed the inverse correlation of p53 expression with LC3 (Fig. 3A). On the contrary, MCF7 and HCT116 cells were transfected with siRNA of p53 (0, 20, 40 nM) for 24 h and LC3 expression was measured by qRT-PCR at linear amplifying curve (Fig. 3B). LC3 transcription was induced by p53 knock down in a dose dependent manner (Fig. 3B). The data suggests that p53 regulates LC3 expression in the level of transcription as a suppressor that is concurred with previous reports (Tasdemir et al., 2008a; Scherz-Shouval et al., 2010). To test whether LC3 transcription is regulated by TGase 2 expression in cancer, CAKI-1 and A549 cells were transfected with TGase 2 siRNA in a series of doses (0, 10, 20, 40 nM) (Fig. 3C), and MCF7 and HCT116 cells were transfected with HA-TGase2 in a series of doses (0, 1, 2, 4 µg) (Fig. 3D). qRT-PCR analysis against LC3 showed a correlation in expression between TGase 2 and LC3 (Fig. 3C). These correlations were inversely correlated with p53 expression at the protein level (Fig. 3E, 3F). We have shown that increase of p53 protein level by TGase 2 knock down in RCC was not due to increase of mRNA level but due to stabilization of p53 protein (Ku et al., 2013). TGase 2 knockdown using siRNA induced p53 protein levels by 5.9-fold in CAKI-1 cell, and TGase 2 inhibition using GK921 also induced p53 levels by 8.3-fold (Fig. 3E). Overexpression of TGase 2 reduced p53 protein levels to 40% of the control, which was recovered up to 1.4-fold of the control by GK921 treatment in MCF7 cells (Fig. 3F). This inverse correlation of p53 and TGase 2 in a variety of cancer cells suggests that wild type p53 is evidently targeted by TGase 2 in cancer cells. In this study, it has been revealed that TGase 2 induces autophagy in cancer cells which can be used to evade cell death from anti-cancer drug treatment. Therefore, TGase 2 inhibition may have benefit in increasing sensitivity to anti-cancer drugs known to be autophagy inducers in cancer, such as rapamycin. To test whether TGase 2 inhibition sensitizes cancer cells to rapamycin, combination treatments of TGase 2 inhibition using GK921 (Fig. 4A), or knockdown using siRNA of TGase 2 (Fig. 4B) with rapamycin were performed in CAKI-1 and A549 cells. Cell survival assay using XTT method showed that single treatment of GK921 (1 µM) induced about 30% and 40% reduction of survival in A549 and CAKI-1 respectively, and single treatment of rapamycin (1 µM) induced about 2% and 10% reduction of survival in CAKI-1 and A549 respectively (Fig. 4A). The combination treatment of GK921 and rapamycin significantly reduced the survival about 70% compared to the control, both in CAKI-1 and A549 cells (Fig. 4A). The same combination using siRNA of TGase 2 also resulted in about 60% and 70% reduction of survival in CAKI-1 and A549, respectively (Fig. 4B). To prove whether targeting TGase 2 is critical to reduce drug resistance, GK921 was treated in a series of doses with the fixed dose of rapamycin (4 µM) treatment to the rapamycin-resistance cell lines (Fig. 4C, 4D). Rapamycin-resistant MCF7 and HCT116 cell lines were selected by gradual increase of rapamycin treatment, which can grow under 4 µM of rapamycin without induction of cell death (MCF7-RR and HCT116-RR). Before selection of rapamycin resistance, the MCF7 and HCT116 cell lines showed the sensitivity that 1 µM of rapamycin reduced the survival about 35% and 50% in HCT116 and MCF7 respectively (Supplementary Fig. 1). Combination treatment of GK921 with 4 µM of rapamycin reduced up to about 54% and 64% of cell survival in a dose-dependent manner in HCT116-RR and MCF7-RR, respectively (Fig. 4C). The same combination using siRNA of TGase 2 instead of GK921 also resulted in about 54% and 60% reduction of survival in HCT116-RR and MCF7-RR, respectively (Fig. 4D). Acquired rapamycin resistant cancer cells induced TGase 2 expression in MCF7 and HCT116 (Fig. 4E). 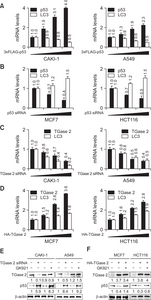 In this study, TGase 2 knockdown decreased LC3 level in cancer cells. The level of LC3 had a correlation with TGase 2 levels in cancer, which concurred with the previous observation that TGase 2 promotes the autophagy process (D’Eletto et al., 2012). The induction mechanism of LC3 expression by TGase 2 was related with p53 regulation, because TGase 2 was a major regulator of p53 under starvation in cancer (Kang et al., 2016). There is a report that LC3 transgenic mice kept in starvation for 24 h manifests an increase in LC3 puncta in hepatocytes, pancreas, and kidney cells (Tasdemir et al., 2008b). This starvation-induced autophagy is observed only in p53 wildtype mice (Tasdemir et al., 2008b). In p53 knockout mice, LC3 puncta are more frequent, but this increased autophagy was not further increased by starvation (Tasdemir et al., 2008a). The result showed clearly an inverse correlation between p53 and LC3 in multiple tissues (Tasdemir et al., 2008a; Scherz-Shouval et al., 2010). Recently the detailed mechanism has revealed that TGase 2 regulates p53 activity directly through polymerization of p53 in RCC (Ku et al., 2013; Kang et al., 2016). TGase 2 competes with HDM2 for binding to p53, promotes autophagy-dependent p53 degradation in RCC cell lines under starvation, and binds to p53 and p62 simultaneously without ubiquitin-dependent recognition of p62 (Kang et al., 2016). During translocation of p53 to the autophagosome through TGase 2 binding, ubiquitination or cross-linking activity is not needed. This finding is in agreement with the observation that TGase 2 cross-linking activity occurs only in the autophagosome during autophagy (Kang et al., 2016). This suggests that TGase 2 acts as a chaperone of p53 with a cross-linking catalytic activity. This interaction may result in rapid autophagy without consuming energy to tag ubiquitin on the p53 protein, as p62 is known to interact with ubiquitinated proteins. 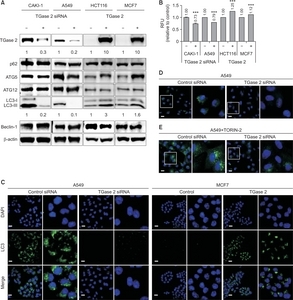 TGase 2 mediated autophagy process is beneficial for cancer cells because it supplies building blocks from recycling tumor suppressor p53 instead of consuming ATP and ubiquitin. In this study, we found that TGase 2 potentiates autophagy by LC3 induction through p53 regulation in various cancer cells. Cancer cell depends on autophagy to get sufficient nutrients under starvation (White, 2012). Autophagy is a pathway that recycles proteins and organelles to produce building blocks including nucleotides, amino acids, and fatty acids to support metabolism and survival (Rabinowitz and White, 2010). The cancer cell adopts this advantage of growth and survival through autophagy. One of the most critical induction mechanism of autophagy is blocking mTOR using rapamycin (Cheong et al., 2012b). Interestingly TGase 2 is also induced by rapamycin treatment in cancer cells (Cao and Huang, 2016). 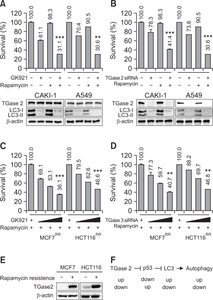 Rapamycin-induced autophagy may induce TGase 2 upregulation that may potentiate autophagy, because TGase 2 inhibition significantly sensitizes mTORC1-hyperactive cancer cells to rapamycin treatment (Cao and Huang, 2016). Here, we found that TGase 2 potentiates the autophagy process by increase of LC3 expression via suppression of p53, which is known as a suppressor of LC3 expression (Tasdemir et al., 2008a) (Fig. 4F). The p53 is regarded as a tumor suppressor that is mutated in a high percentage of human tumors. However, many other tumors retain wild-type p53 expression that post-transcriptionally down-regulates LC3 under starvation (Scherz-Shouval et al., 2010). This implies that p53 increases cell survival through adjusting the rate of autophagy to the circumstances for autophagic homeostasis. In this study, TGase 2 induces LC3 transcriptional level by down regulation of protein level of p53, which is closely associated with rapamycin resistance. This suggests that cancer cells adopt autophagy for an advantage of drug resistance through TGase 2 mediated p53 regulation. In conclusion, we found that TGase 2 induces LC3 transcription levels by p53 depletion in cancer cells. Therefore, TGase 2 inhibition showed potential therapeutic advantage of synergistic anti-cancer drug effect with rapamycin by blocking autophagy induction in cancer. This work was supported by the National Cancer Center Grant (NCC-1410280-5). Fig. 1. TGase 2 regulates autophagy in cancer cells. (A) Immunoblottings of autophagy markers in cancer cells showed TGase 2 is associated with autophagy in cancer. CAKI-1 and A549 cells were transfected with siRNA of TGase 2 for 24 h while MCF7 and HCT116 cells were transfected with HA-TGase 2 plasmid for 24 h. Before harvest cells, cells were treated with chloroquine (CQ, 50 µM) for 6 h under amino acid deprivation for 4 h. Whole-cell lysates were subjected to the immunoblotting with indicated antibodies. (B) Autophagy activity was regulated by TGase 2 in cancer cells. Under the same conditions as above (A), cells were stained with CYTO-ID green detection reagent for autophagy activity analysis. Fluorescence was measured at wavelength 488 nM. (C) Confocal microscopy images showed that induction of LC3 (green) is regulated by TGase 2 expression in A549 and MCF7. (D) TGase 2 knock down reduced autophagy in A549. GFP-LC3 stable expressed A549 cells were transfected with TGase 2 siRNA for 24 h. (E) TORIN-2 induced autophagy was significantly reduced by TGase 2 siRNA treatment. GFP-LC3 puncta were analyzed by live imaging using confocal microcopy. Cells were counterstained with DAPI to visualize the nuclei. Cumulative data from three independent experiments is shown here as mean ± SD (n=3). ***p<0.001, Scale bar: 20 µm. Fig. 2. Inhibition of TGase 2 induces p53 stability. (A) Before harvest the samples, CAKI-1 and A549 cells were treated with GK921 (0, 250, 500, 1000 nM) for 8h, overlapped with chloroquine treatment (CQ, 50 µM) for 6 h under amino acid deprivation for 4 h. Whole-cell lysates were subjected to the immunoblotting with indicated antibodies. (B) Under the same condition as above, cells were stained with CYTPO-ID green detection reagent for autophagy activity. (C) Cells with the low level of TGase 2 such as HCT116 and MCF7 or TGase 2 transfected cells such as HCT116TG2 and MCF7TG2 cells were treated with GK921 (0, 250, 500, 1000 nM) for 8h, under the same condition as above. Whole-cell lysates were subjected to immunoblotting of TGase 2 as well as measuring autophagy activity using CYTO-ID green detection reagent. Cumulative data from three independent experiments is shown here as mean ± SD (n=3). ***p<0.001. Fig. 3. LC transcription is suppressed by p53 in cancer cells. (A) p53 transfection suppressed LC3 expression. CAKI-1 and A549 cells were transfected with 3xFLAG p53 (p53 over-expression vectors: 0, 1, 2, 4 µg) for 24 h, and treated with chloroquine (50 µM) for 6 h under amino acid deprivation for 4 h. qRT-PCRs against p53, LC3 and β-actin were performed as described in the methods. (B) p53 knock down increased LC3 expression. MCF7 and HCT116 cells were transfected with siRNA of p53 (0, 20, 40 nM) for 24 h, and treated with chloroquine (50 µM) for 6 h. Real-time PCR against p53, LC3 and β-actin were performed as described in the methods. (C) TGase 2 knock down decreased LC3 expression. CAKI-1 and A549 cells were transfected with TGase 2 siRNA for 24 h in a dose dependent manner (0, 10, 20, 40 nM) (D) TGase 2 transfection increased LC3 expression. MCF7 and HCT116 cells were transfected with HA-TGase2 in a dose dependent manner (0, 1, 2, 4 µg). (E) TGase 2 knock down or inhibition increased p53 level. CAKI-1 and A549 cells were transfected with siRNA of TGase 2 or treated with GK921 (1 µM). (F) TGase 2 transfection decreased p53, which was reversed by TGase 2 inhibition. MCF7 and HCT116 cells were transfected with HA-TGase 2 plasmid alone or combined with GK921 (1 µM). Fig. 4. TGase 2 inhibition or TGase 2 knock down reversed rapamycin resistance in cancer cells. (A) TGase 2 inhibition reversed rapamycin induced autophagy in cancer cells which potentiated anti-cancer effect with rapamycin. CAKI-1 and A549 cell were treated with GK921 or Rapamycin and combination for 24h with chloroquine (50 µM) for 6 h under amino acid deprivation for 4 h. (B) TGase 2 knock down reversed rapamycin induced autophagy in cancer cells which potentiated anti-cancer effect with rapamycin. Under the same condition of (A), these cells were treated with TGase 2 siRNA or rapamycin and combination of TGase 2 siRNA and rapamycin. (C) XTT assay showed that TGase 2 inhibition reversed rapamycin resistance. Rapamycin resistant cancer cells of MCF7RR and HCT116RR were cultured with Rapamycin (20 µM). The cells were treated with TGase 2 inhibitor GK921, rapamycin and combination of GK921 and rapamycin for 24 h. (D) XTT assay showed that TGase 2 knock down reversed rapamycin resistance. Rapamycin resistant cancer cells of MCF7RR and HCT116RR were treated with siRNA of TGase 2, rapamycin and combination of siRNA of TGase 2 and rapamycin for 24 h. Cumulative data from three independent experiments is shown here as mean ± SD (n=3). **p<0.01, ***p<0.001. e="" tgase="" 2="" was="" increased="" in="" the="" drug="" resistant="" cancer="" cells="" analyzed="" by="" immunoblotting="" of="" tgase="" 2="" rapamycin="" resistant="" cancer="" cells="" such="" as="" mcf7="" sup="">RR and HCT116RR showed higher expression level of TGase 2 to compare to rapamycin sensitive cancer cells such as MCF7 and HCT116. (F) Summary of TGase 2 mediated regulation of autophagy. Birgisdottir, AB, Lamark, T, and Johansen, T (2013). The LIR motif - crucial for selective autophagy. J. Cell Sci. 126, 3237-3247. Cao, J, and Huang, W (2016). Compensatory increase of transglutaminase 2 is responsible for resistance to mTOR inhibitor treatment. PLoS ONE. 11, e0149388. Cao, L, Petrusca, DN, Satpathy, M, Nakshatri, H, Petrache, I, and Matei, D (2008). Tissue transglutaminase protects epithelial ovarian cancer cells from cisplatin-induced apoptosis by promoting cell survival signaling. Carcinogenesis. 29, 1893-1900. Cheong, H, Lindsten, T, and Thompson, CB (2012a). Autophagy and ammonia. Autophagy. 8, 122-123. Cheong, H, Lu, C, Lindsten, T, and Thompson, CB (2012b). Therapeutic targets in cancer cell metabolism and autophagy. Nat. Biotechnol. 30, 671-678. D’Eletto, M, Farrace, MG, Falasca, L, Reali, V, Oliverio, S, Melino, G, Griffin, M, Fimia, GM, and Piacentini, M (2009). Transglutaminase 2 is involved in autophagosome maturation. Autophagy. 5, 1145-1154. D’Eletto, M, Farrace, MG, Rossin, F, Strappazzon, F, Giacomo, GD, Cecconi, F, Melino, G, Sepe, S, Moreno, S, Fimia, GM, Falasca, L, Nardacci, R, and Piacentini, M (2012). Type 2 transglutaminase is involved in the autophagy-dependent clearance of ubiquitinated proteins. Cell Death Differ. 19, 1228-1238. Folk, JE (1980). Transglutaminases. Annu. Rev. Biochem. 49, 517-531. Kang, JH, Lee, JS, Hong, D, Lee, SH, Kim, N, Lee, WK, Sung, TW, Gong, YD, and Kim, SY (2016). Renal cell carcinoma escapes death by p53 depletion through transglutaminase 2-chaperoned autophagy. Cell Death Dis. 7, e2163. Kang, SK, Lee, JY, Chung, TW, and Kim, CH (2004). Overexpression of transglutaminase 2 accelerates the erythroid differentiation of human chronic myelogenous leukemia K562 cell line through PI3K/Akt signaling pathway. FEBS Lett. 577, 361-366. Kim, DS, Choi, YB, Han, BG, Park, SY, Jeon, Y, Kim, DH, Ahn, ER, Shin, JE, Lee, BI, Lee, H, Hong, KM, and Kim, SY (2011). Cancer cells promote survival through depletion of the von Hippel-Lindau tumor suppressor by protein crosslinking. Oncogene. 30, 4780-4790. Kim, SY (2011). Transglutaminase 2: a new paradigm for NF-kappaB involvement in disease. Adv. Enzymol. Relat. Areas Mol. Biol. 78, 161-195. Ku, BM, Kim, DS, Kim, KH, Yoo, BC, Kim, SH, Gong, YD, and Kim, SY (2013). Transglutaminase 2 inhibition found to induce p53 mediated apoptosis in renal cell carcinoma. FASEB J. 27, 3487-3495. Ku, BM, Kim, SJ, Kim, N, Hong, D, Choi, YB, Lee, SH, Gong, YD, and Kim, SY (2014). Transglutaminase 2 inhibitor abrogates renal cell carcinoma in xenograft models. J. Cancer Res. Clin. Oncol. 140, 757-767. Lee, J, Kim, YS, Choi, DH, Bang, MS, Han, TR, Joh, TH, and Kim, SY (2004). Transglutaminase 2 induces nuclear factor-kappaB activation via a novel pathway in BV-2 microglia. J. Biol. Chem. 279, 53725-53735. Munafo, DB, and Colombo, MI (2001). A novel assay to study autophagy: regulation of autophagosome vacuole size by amino acid deprivation. J Cell Sci. 114, 3619-3629. Scherz-Shouval, R, Weidberg, H, Gonen, C, Wilder, S, Elazar, Z, and Oren, M (2010). p53-dependent regulation of autophagy protein LC3 supports cancer cell survival under prolonged starvation. Proc. Natl. Acad. Sci. U.S.A. 107, 18511-18516. Tasdemir, E, Chiara Maiuri, M, Morselli, E, Criollo, A, D’Amelio, M, Djavaheri-Mergny, M, Cecconi, F, Tavernarakis, N, and Kroemer, G (2008a). A dual role of p53 in the control of autophagy. Autophagy. 4, 810-814. Tasdemir, E, Maiuri, MC, Galluzzi, L, Vitale, I, Djavaheri-Mergny, M, D’Amelio, M, Criollo, A, Morselli, E, Zhu, C, Harper, F, Nannmark, U, Samara, C, Pinton, P, Vicencio, JM, Carnuccio, R, Moll, UM, Madeo, F, Paterlini-Brechot, P, Rizzuto, R, Szabadkai, G, Pierron, G, Blomgren, K, Tavernarakis, N, Codogno, P, Cecconi, F, and Kroemer, G (2008b). Regulation of autophagy by cytoplasmic p53. Nat. Cell Biol. 10, 676-687. Verma, A, Guha, S, Wang, H, Fok, JY, Koul, D, Abbruzzese, J, and Mehta, K (2008). Tissue transglutaminase regulates focal adhesion kinase/AKT activation by modulating PTEN expression in pancreatic cancer cells. Clin. Cancer Res. 14, 1997-2005. White, E (2012). Deconvoluting the context-dependent role for autophagy in cancer. Nat. RevCancer. 12, 401-410.